Google has helped millions of businesses address their content management challenges and transform the way they work by offering G Suite, which provides a set of user-friendly collaboration tools with the security, controls, and compliance every enterprise needs. 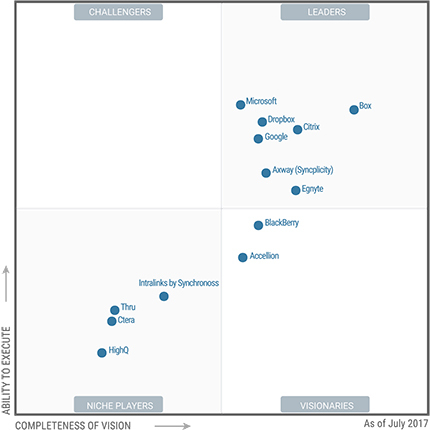 Google is named a Leader in the Gartner 2017 Magic Quadrant for Content Collaboration Platforms (CCP). We are honored by Gartner's recognition in this report, which evaluates vendors based on their vision and ability to execute. The above graphic was published by Gartner, Inc. as part of a larger research document and should be evaluated in the context of the entire document. The Gartner document is available upon request from Google. Fill out the form to get the full report now.